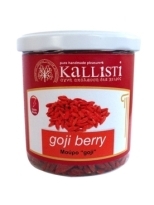 Goji, goji berry or wolfberry is the fruit of Lycium barbarum and Lycium chinense, two closely related species of boxthorn in the Nightshade family, Solanaceae. The family also includes the potato, tomato, eggplant, belladonna, chili pepper, and tobacco. Over time, people have used goji berries to try to treat many common health problems like diabetes, high blood pressure, fever, and age-related eye problems. Today, it is used as a natural daily dietary supplement.